AGQ Labs USA offers analytical testing services to the food industry for Prop 65 compliance. Below are additional tabs with a wealth of Prop 65 information specific to the food industry. The Safe Drinking Water and Toxic Enforcement Act of 1986 (Prop 65) was enacted as a ballot initiative by Californians. The California Office of Environmental Health Hazard Assessment (OEHHA) administers the Prop 65 program and is part of the California Environmental Protection Agency (Cal/EPA). Prop 65 requires that the State of California publish a list of known chemicals to cause cancer, birth defects, or other reproductive harm. This list has grown to over 800 chemicals since 1987. The act requires that all businesses that sell products in California to notify consumers if a product contains a significant amount of one of these chemicals. A business may choose whether to provide a warning label based on either knowledge or an assumption of the presence of a listed chemical. While this may work for non-food businesses, a warning of this nature can significantly impact a food organization’s brand and business. Enforcement of Prop 65 is carried out by civil lawsuits. Private parties acting in the public interest are the most common filer of these type of lawsuits. Lawsuits can also be brought by the California Attorney General, a district attorney or a city attorney. Private parties can only bring Prop 65 lawsuits if they have provided at least 60 day notice of the alleged violation to the business. Companies that fail to comply with Prop 65 can result in a 60-Day Notice of non-compliance for a settlement and/or a civil lawsuit. If no settlement is met in the 60 days, your company can be taken to court. Most cases end up being settled out of court. Both of these can lead to significant costs, from tens of thousands to millions of dollars. Failing to respond to a 60-day notice can cause for additional complaints to be filed against your company and can add to costs. The State of California Department of Justice Office of the Attorney General's website for Prop 65 maintains an annual summary for private settlements on its site. In 2015, over $26 million in settlements were paid for Prop 65 cases. The OEHHA has developed "safe harbor numbers" for determining whether a warning is necessary. This list has over 300 of the 800+ chemicals on the Prop 65 list. The safe harbor level list allows businesses to be exempt from providing a warning if the exposure will be less than the safe harbor level. 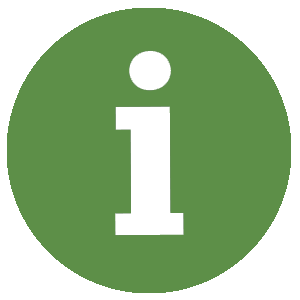 What if there is no Safe Harbor Number for a listed chemical? If no Safe Harbor Level is established for a chemical, businesses are required to provide a Prop 65 warning unless the company can prove that the anticipated exposure levels will not pose a significant risk of cancer or reproductive harm. This burden falls entirely on the business. More information regarding what to do when there is no safe harbor level can be found on the OEHHA website here. In the food industry, the most common Prop 65 lawsuits involve chemicals with safe harbor levels. Prop 65 compliance in the food industry has not received a great amount of attention and the amount of information available to public is limited. When issued a 60-day notice from a noticing party, the analytical results, methods, and calculations the noticing party used to ascertain their basis for sending the notice do not have to be disclosed by the noticing party unless you go to court. Prop 65 warning requirements are related to exposure levels to a chemical per day (μg/day) rather than the amount of a chemical that a product contains. In food, this exposure is mainly from ingestion of the food. Quantitative testing results are in the amount of a chemical that a sample/product contains such as milligrams of a chemical per kilogram of sample (mg/kg=ppm=μg/g). OEHHA guidelines- Use data from the National Health and Nutrition Examination Survey (NHANES) performed by the Centers for Disease Control and Prevention (CDC) to determine the mean daily intake of a food. See Mean Intake Determination below. Use the serving size amount on label. This is recommended only when food is not identified or data is limited in the NHANES data because Prop 65 Safe Harbor Levels are for exposure to a chemical in a day. Using the serving size does not account for when food is consumed multiple times in a day but we have come across court cases where it was used. Equation 1 below determines the amount of a chemical that someone is exposed to when they consume a food product. 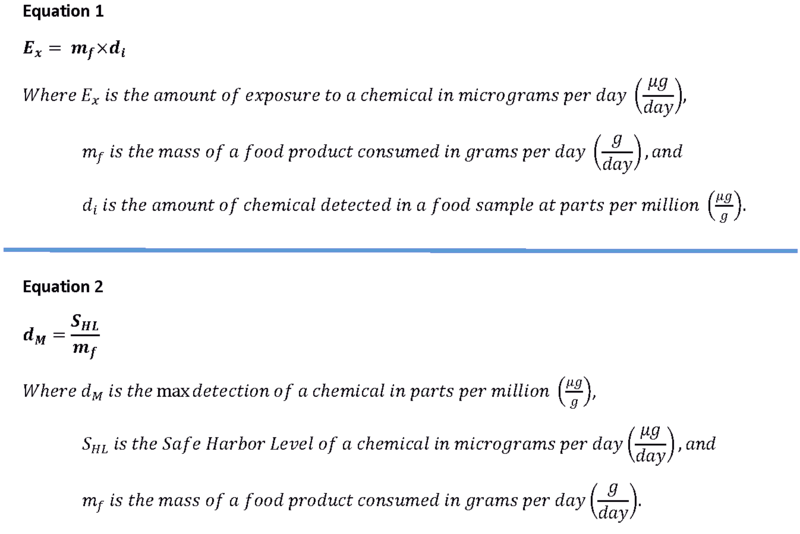 Equation 2 determines the maximum detection level of a chemical for any Safe Harbor Level. Lead exposure is one of the leading reasons for food companies to receive a 60-day notice. This is due to a combination of lead's abundance on Earth (both naturally and human-caused) and from it's low safe harbor level of 0.5 μg/day. The figure below shows you how the Prop 65 maximum detection of lead in a food changes based on the mean intake of the food. 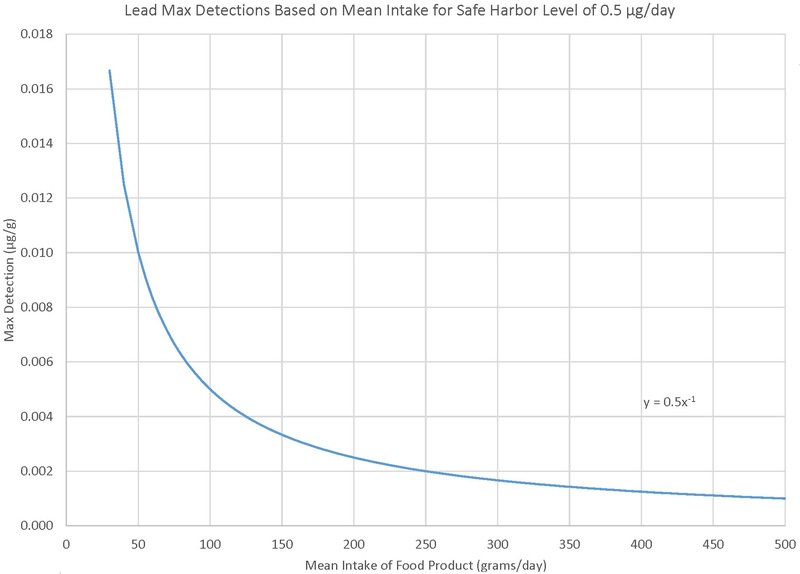 For any safe harbor level, the maximum detection of the chemical in a food product can be calculated by dividing the safe harbor level by the mean intake of the food product. OEHHA guidelines use data from the National Health and Nutrition Examination Survey (NHANES) performed by the Centers for Disease Control and Prevention (CDC) to determine the mean intake. A major problem with these publicly available databases is that they are published in an uncommon statistical database format (XPT). The CDC has instructions on how to access these databases using a free version of the recommended software but in our experience the free software version freezes up when you try to open the larger databases. Additionally, the raw data is not user friendly and has numerous fields that are not needed to determine the mean intake of a food product. Below is a link to download a copy of this data in Excel that has been modified to be more user friendly and to include only relevant information needed to determine the mean intake a food product. Please note that this Excel file is very large and we recommend that you close all other programs on your computer before opening the file. This information is provided to the public as a courtesy only. AGQ USA can only provide additional assistance to our customers in determining the mean intake value of their products on a limited basis. Current customers can contact our food safety team for more information.